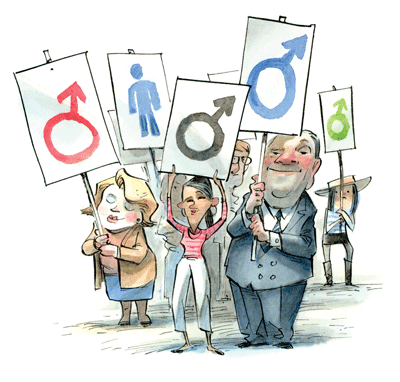 Gender bias: It's alive, well, and part of your teenager's thinking, as least according to a new report released by the Ed School's Making Caring Common Project. Based on a survey of nearly 20,000 students, many teen boys and teen girls — and some of their parents — have biases against teen girls as leaders. For example, the report found that 40 percent of boys and 23 percent of girls preferred male political leaders to female. Only 4 percent of boys and 8 percent of girls preferred female political leaders. The survey also found that, on average, mothers also expressed stronger support for student councils led by boys. As the report notes, "These findings may reflect the degree to which females of all ages in this country have been affected by stereotypes about their capacities. Given that mothers are typically role models for girls and that girls tend to be highly responsive to their mothers' aspirations and expectations of them, these findings are concerning." What can parents and teachers do? The Leaning Out: Teen Girls and Leadership Biases report, which received widespread media coverage in places like The New York Times, CBS News, and The Atlantic, offers two toolkits: one with tips for parents, the other with tips for educators. Mix it up. Proactively start conversations with your kids about how responsibilities get divvied up in your family. Talk about what is fair and balanced, rather than make assumptions about who does what based on gender. Create a chore wheel so that everyone gets a chance to participate in all the types of chores. Be willing to model behavior that doesn't fit gender stereotypes and show kids that you can step outside your own comfort zone. Ask youth to participate in a series of quiet reflective writing exercises about what is it like (or, for boys, what they think it must be like) to be a girl. Have they ever felt discriminated against? Felt different than boys? Allow youth to share their writing, if they feel comfortable doing so. Try the same activity asking students to reflect on what it is like to be a boy.